A fine art print of "Cullasaja Color" makes a great focal point for a social room or the dining room. 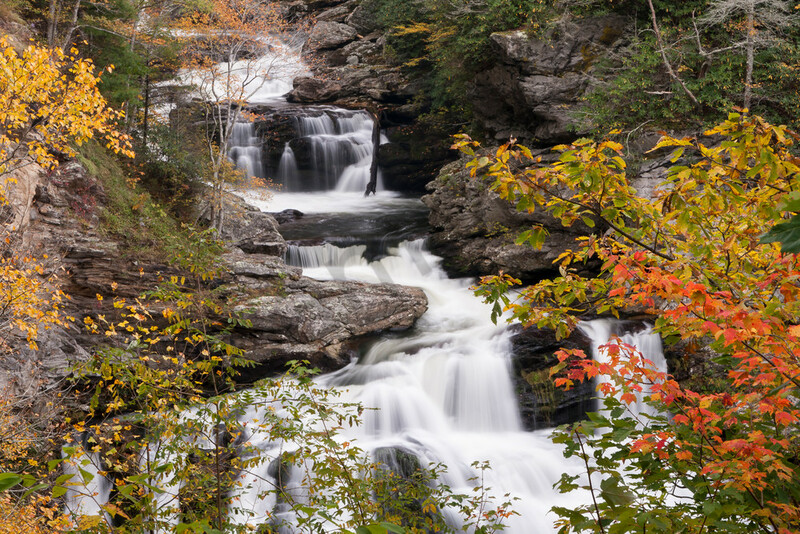 The richly colored foliage frames the Cullasaja River as it flows over its namesake falls. Worry not, you will not need to pronounce it to feel its fresh and powerful energy! Charging through the dense forest of North Carolina's Highlands, the Cullasaja River puts on a watery show. Large boulders and steep topography send the river through a series of switchbacks and small drops on its way downstream. Cullasaja Falls is a breathtaking display, with a series of drops and a wide cascade dropping more than 200 feet. And it breaks one of the cardinal waterfall rules by offering such excitement without a strenuous hike to reach it! It may be difficult to say Cullasaja Falls, but once experienced it will be equally hard to forget. "Cullasaja Color" is part of my Waterfall Wall Art series. Best displayed as a metal print, the rich colors and bold patterns captivate the imagination. Each metal print is ready to hang without a frame, providing a bold, modern look. For a softer, more pastel appearance, choose a canvas print. Two museum-quality fine art papers are also available, should you prefer a more traditional look.